Price: VyprVPN is definitely not the cheapest VPN on the market, but considering its services, the price is more than reasonable. Difficult to use: While Vypr tutorials and the apps make things way easier, VyprVPN can be a little complicated to use for some users. Nonetheless, if you put some time into it, it allows you to personalize your connection to maximize the potential of your VPN. Why is VyprVPN the most secure VPN? Accessing the internet can potentially be dangerous, as other people can access your personal data and use it for their own benefit (identity theft or by using your banking information, for example). This danger is greatest in some countries in Asia, most of all on public networks. Below, you will find three reasons I think VyprVPN is one of the most secure VPNs that exists. Encryption protocols: VyprVPN offers you its own encryption protocols, including PPTP, OpenVPN™, L2TP/Ipsec, and Chameleon™ (exclusive to VyprVPN). This might sound too technical to you, but what you need to know is that OpenVPN 256 and Chameleon are two very robust encryption protocols, and as a result, are very secure against any attempt to decrypt your data. Nonetheless, due to their high degree of security, they are slower than PPTP or L2TP/Ipsec. Its own servers: The VyprVPN company is the owner of the servers it uses. This is very important for security, as the fewer the intermediaries that can access your internet use, the more secure your information will be. While this may seem silly, there are many VPN providers who outsource to third party server providers, and in the end, you don’t really know who has access to your data. NAT Firewall: This is an extra service that VyprVPN offers as a part of its subscription (the majority of VPNs don’t offer it, or it is very expensive), and is essential for security on public networks. While a VPN protects your internet use data by maintaining it private, it does not protect from other users of a public network accessing your device and taking your data directly. This point is very important if you are traveling and you often go to coffee shops to connect to the internet, as public networks are a possible source of hacker attacks that turn into scams. 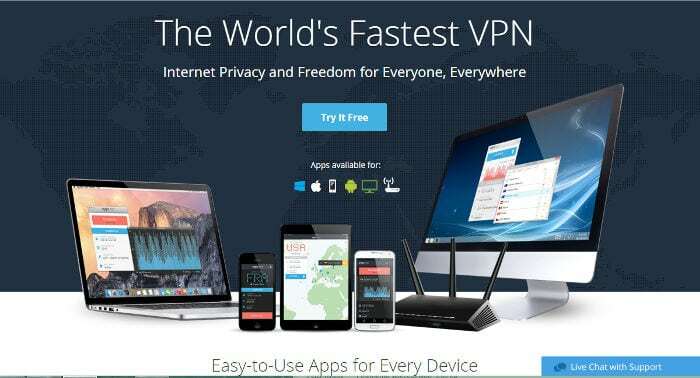 Click here to try VyprVPN for free! 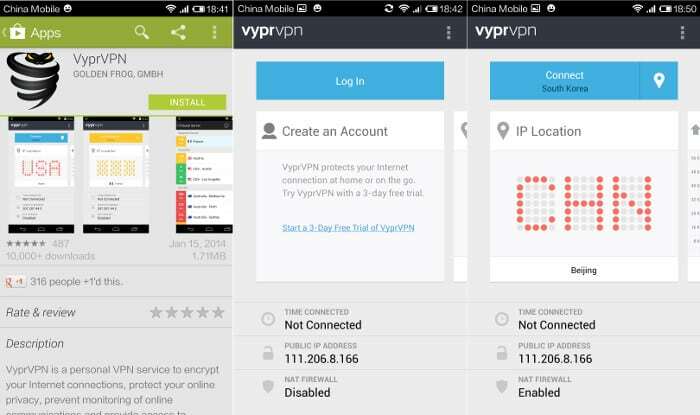 Installing VyprVPN on my smartphone: As you can see, it only took me two minutes to download the app, sign in, configure my connection, select a server and activate my VPN. How much does it cost and what option should I choose? VyprVPN is not the cheapest VPN on the market, but like always, you get what you pay for, and I think that the features that I have just described are well worth a few more Dollars. At the moment VyprVPN offers 2 options: the “basic” option costs 9.95 USD per month (or 5 USD per month, if you pay for 12 months in advance): you will get 3 simultaneous connections and all the encryption protocol described above (excluding the Chameleon protocol). While this package may be enough for some people, you can also go for the “premium package”, which costs 12.95 USD per month (or 6.67 USD per month, if you pay for 12 months in advance): you will get five simultaneous connections, all of the encryption protocols that I listed above, and the NAT Firewall (particularly useful on wireless connections). 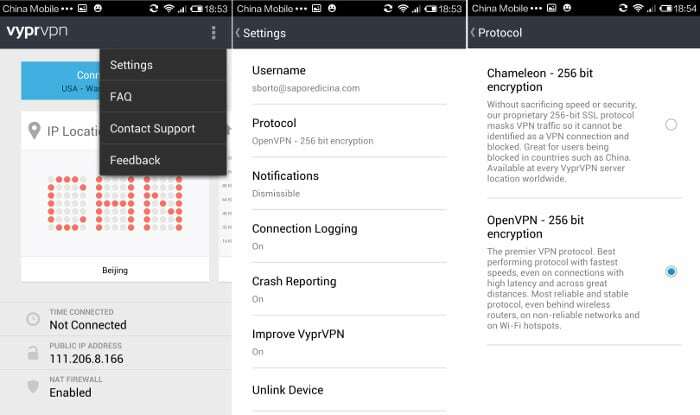 In this last section, you can find some suggestions on how to make the most of VyprVPN. First of all, use the protocol that meets your needs. To select the most adequate protocol, read the brief description offered by the software. For example, if your priority is the security of the connection, you should use the OpenVPN protocol. On the other hand, if you don’t mind sacrificing a bit of security in exchange for speed, you might prefer the PPTP protocol. To select a protocol, go to the tools menu of the VyprVPN application (the gear icon on Apple devices or the three points icon on Android devices) -> click on Settings -> click on Protocol and select the protocol (see the above screenshot). 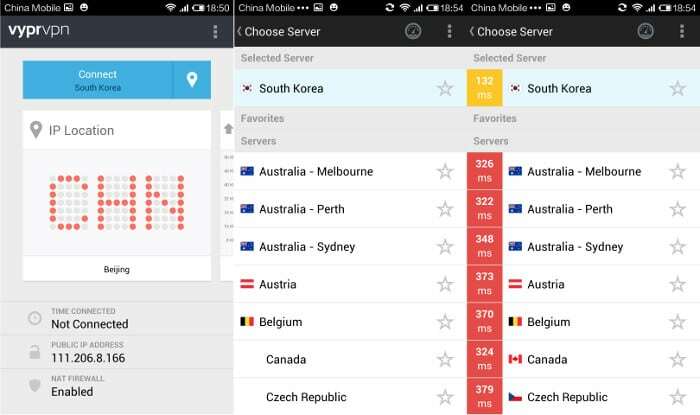 Testing the ping and selecting the best server: Because I’m in China, the best servers for me are the ones located in Japan, Hong Kong, and South Korea, which is why I selected South Korea. Test the ping (this is the time between the device and the server) and select the best server. You can do this by clicking on the “location” icon (beside the connect button), clicking on the “speedometer” button (beside “select server,” see screenshot), and selecting the server which returns your ping the quickest (given in milliseconds, ms), as a shorter ping means a faster connection. VyprVPN is an excellent option if your want to browse securely, in particular in certain countries where accessing public networks implies a risk. 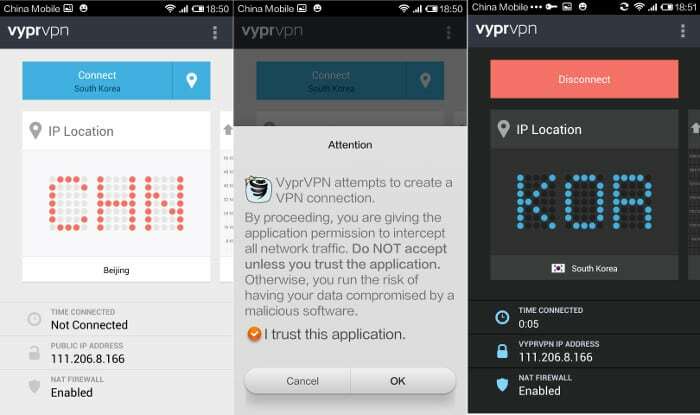 In addition, VyprVPN has proved to be a fast and reliable VPN for avoiding geographic limitations on internet use.